It's been a busy day for Motorola, what with word it's got a new smartwatch coming and all. But the product news didn't stop there. In addition to an MWC 2014 exec sit-down, Moto fielded questions on Twitter, and one inquisitor raised the Q of when we can expect the next version of Moto X. "A: Keep posted - hint - late summer," Motorola wrote in response. 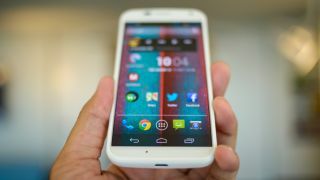 There was no real question a new Moto X was in the works, even after its maker ran off with Lenovo. Still, it's always nice to have something to look forward, even if we're still lacking specifics. Do you Desire a new HTC phone hands on review?